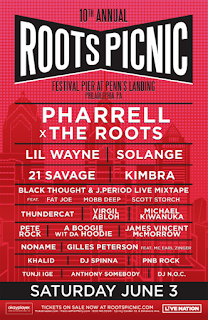 Featuring an All-Star Lineup Over 3 Stages Including a Headlining set by Pharrell and The Roots, as well as Lil Wayne, Solange, 21 Savage, Kimbra and more! 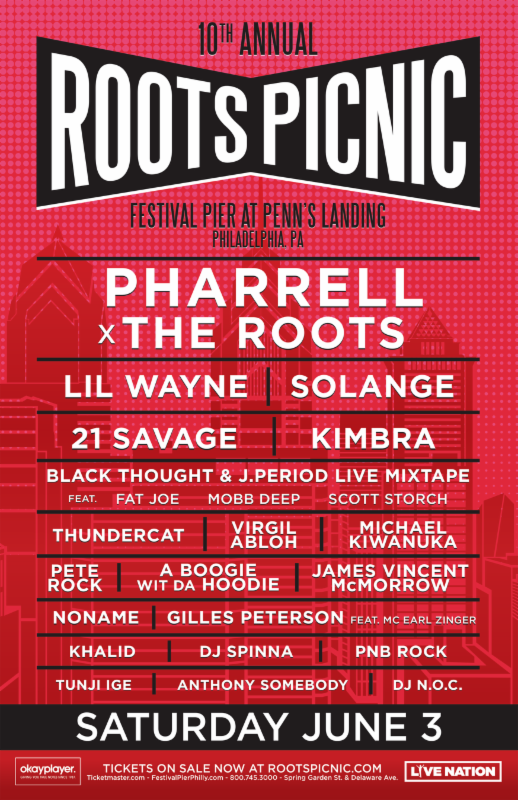 The legendary Roots crew announce that their annual ROOTS PICNIC is returning to Philadelphia's Festival Pier at Penn's Landing on SATURDAY, JUNE 3, 2017. The acclaimed festival, now celebrating its tenth year, will feature an eclectic lineup with performances by: Pharrell & The Roots (joint headline set), Lil Wayne, Solange, 21 Savage, Kimbra, Gilles Peterson and more (full line up below). Tickets are on sale NOW at Ticketmaster.com, Ticketmaster Outlets, Live Nation Box Office or by-phone at 800-745-3000.